frogs in the pond ! the ice has finally melted from the pond, and there were a few frogs to be seen in the pond (if you crept up slowly and quietly that is ) its to be hoped they don't get round to spawning any time soon, as we are due for a few frosty nights over the next few nights ! Re: frogs in the pond ! Two frogs in my pond at the moment. They hang around the pond plants at the back of the picture. Based on past experience, they are probably both male. We usually have a number of males in the pond, and we have had no spawn for several years now. Nor have I spotted any female frogs for a couple of years. 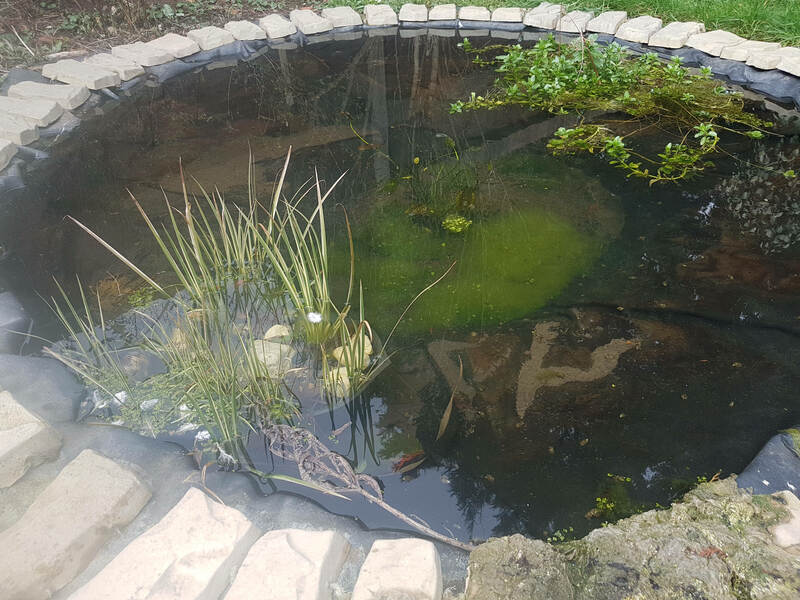 Last year, I relocated the pond to bring it out into the open, away from trees. The pond was collecting a lot of debris where it was, and all oxygenating plants had died. I don't know if the females decided to go elsewhere, of if they had all died since introducing frogs to this urban garden more than 10 years ago. Also last year, I reared some froglets from a small clump of spawn that I brought home. I wonder if any of the females will survive to spawn next year or the year after (I read they take 2-3 years to reach maturity). I wonder if any of the males here now will live to see another adult female. The water is really quite clear, even though the pond is still becoming established. Certainly frog-worthy, in my opinion. The frogs will have a good chance, I think. Apart from the lack of surrounding habitat and high levels of predation that is! I have a small pond, it's only 35 gallons and earlier this year when I was clearing out the debris, a rather large frog came up on my small shovel. I gave me a disapproving look and hopped back in. It would be nice if I had some spawn this year. A couple of years ago I added some spawn from a local pool and raised many tadpoles. I fed them boiled lettuce and dandelion leaves! while we seem to get lots of frogs in the pond, (30/40) there is only usually 4/5 small clumps of spawn laid each year, so i'm wondering if most of ours are males too ? while most of the frogs are dark coloured, there was one very pale, almost yellow looking one among them this morning.